100% of the REWARD from this post will go to the foundation! 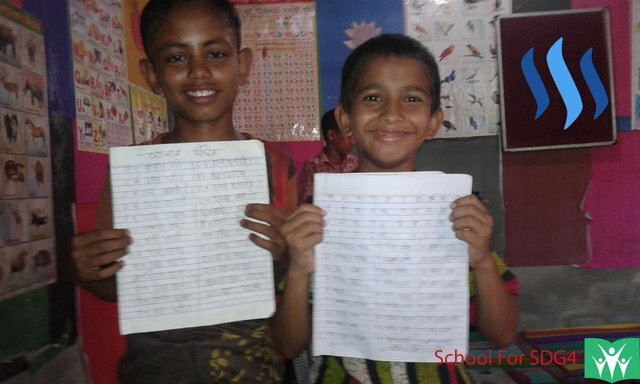 As Adsactly is a decentralized platform to leverage individual initiative, let me introduce a Charity School that uses crowdfunding to educate slum children at Gashitula Mukambari, Sylhet, Bangladesh. What is School For SDG4 ? School For SDG4 is a charity facility founded by Mohammed Abdul Aziz ( @Azizbd ) in 20th April, 2016. The school has been working to provide free access to quality education for about 50 underprivileged children at Gashitula, Mukambari Road, Syllhet with global goal to achieve Sustainable Development Goal 4 by 2030 . The school is promoting educational activities on other social media like Facebook , Twitter , Instagram , Youtube for a long time. 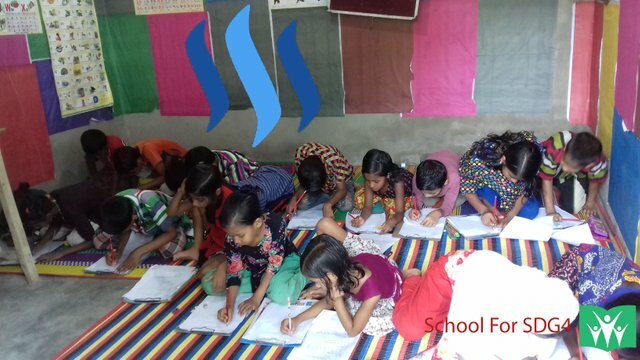 The school currently has thousands of benefactors from Steemit community who upvote posts and share their wealth by donating directly. Last withdrawal of the school liquid SBD was 509.17 SBD to buy new school laptop and meet other expenditures of the school. 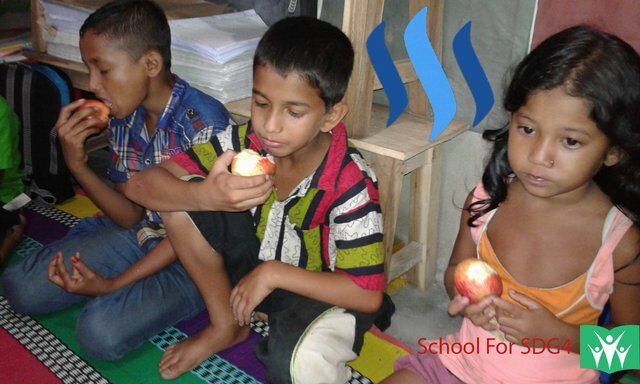 @SchoolForSDG4 crowdfunding for weekly fruits and snacks program which aims is to provide 50 underprivileged kids with some fruits on a weekly basis, with the help of your upvotes and direct donations. 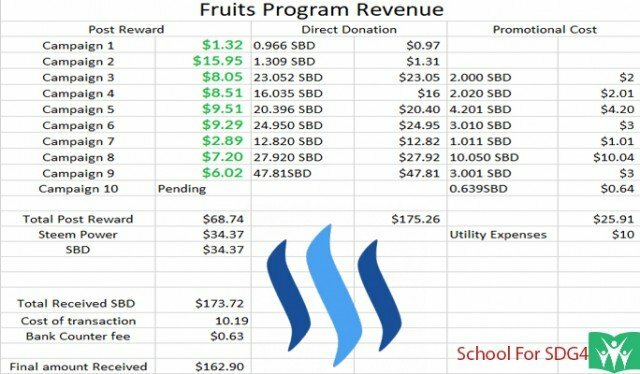 The weekly fruits program is fully sponsored by Steemit Community. Many powerful steemians are supporting the cause with upvotes. 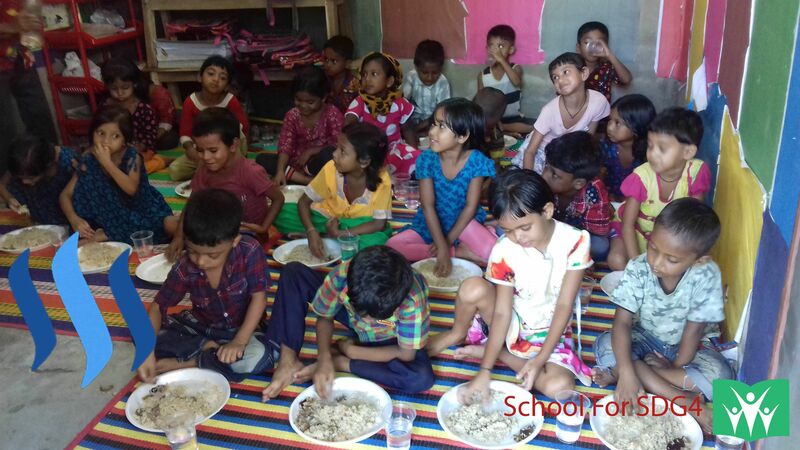 The project has received great support from Steemit Community to feed the kids at School. Last overall report mentioned all revenue and expenses. The school arranged many food programs in different times, including School Lunch Program. It was a live program on facebook. The school's main objective is to educate underprivileged children who usualy wouldn't be able to go to school, because of poverty. 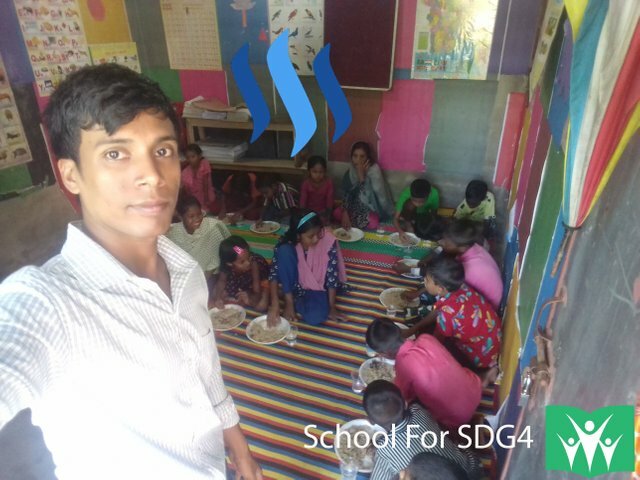 The school has been sharing its educational activities on Steemit for couple of months from @SchoolForSDG4 account. About a million of children in Bangladesh live on the streets. As global citizens, we are not out of the Earth, but separated only by man made borders. These kids are not street children, but they are from local slums. Some of them go to market for work. One of the children "Al-Amin", used to go to market to work. With the help of Steemit, the school brought him back again. The above video is more than a year old, of when kids were enjoying an educational cartoon. Kids from slums have very little opportunity to lean about technology. They now have access to computer typing and can also learn English and watch moral stories, watching cartoons and movies. The school also crowdfunded for different causes like School bags allocation and new school laptop. Every person in the world needs money, Some need money to buy a new car, some need money to buy a new pen or a new bags. We define our needs and demand according to our point of view. The children deserve better education and a chance to prosper in life. @Adsactly donated around $60 dollars for School Bags allocation program which was biggest donation for the school bags allocation program. On 16th of October, 2017, The school received lots of gifts from @tecnosgirl, USA. 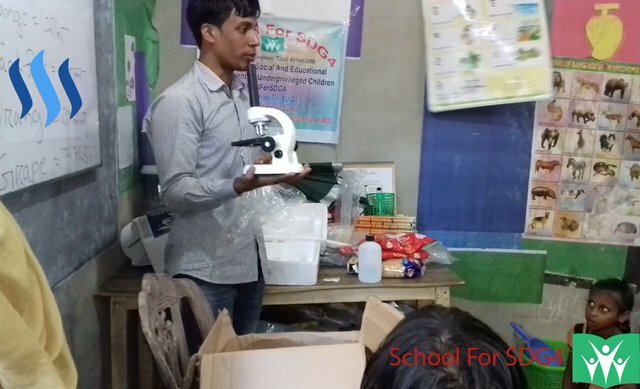 She sent science equipment from United States to Bangladesh and Halloween surprise chocolates for children. Many of you supported the crowdfunding campaign to cover shipping costs. The school is going to share educational activities and crowdfunding stories on Steemit through @Adsactly blog. Your support will help @SchoolForSDG4 to get more revenue from the posts as Adsactly will pay 50% (Liquid SBD) to Adsactly post author. 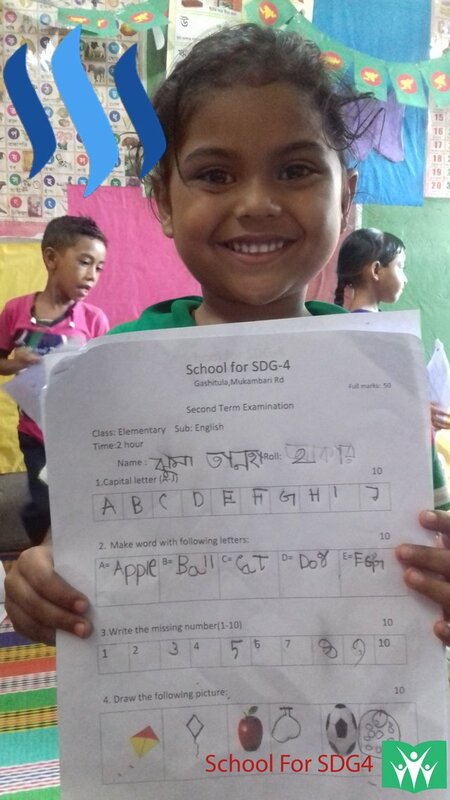 So 50% of SBD will go to @SchoolForSDG4 . Please Stay in Touch with @SchoolForSDG4 for regular updates. @SchoolForSDG4 will share weekly updates of the school's educational activities with you, through Adsactly blog, if you are interested. Please comment your opinion below regarding the charity school. Please contact @Azizbd for any information https://steemit.chat/direct/azizbd or in Adsactly Community as Adsactly Bangladesh Manager https://discord.gg/9AQWBYH . Authored by Mohammed Abdul Aziz ( @Azizbd ), founder of @SchoolForSDG4 . First time I see this kind of stuff here. 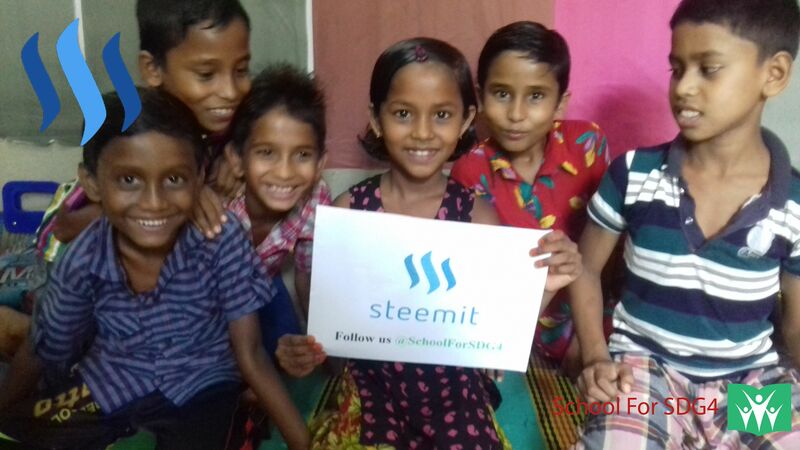 What a powerful gesture and path to take to give back with Steem while giving the children and all communities involved the ways to empower themselves through decentralized cryptocurrencies. Thank you for sharing, you get all my support, upvotes and a resteem! Thank you very much for your support. I hope it will go long way through decentralized cryptocurrencies. Sweet looking kids. Keep up the good work. Thank you very much for reading. I will keep working and promoting them on steemit. I am so glad to see all the different people who are posting to raise funds for these kids. As you can imagine these kids are special to me, as soon as I read the first story I was hooked. Thanks for the mention, I hope you don't mind but I also mention this post is my latest post for the school. I love steemit for many reason, but this is my favorite one, how a bunch of people can make a vote and change lives. Thank you @girlneforemirror . I will. Hope the platform will bring change in lives all over the world. This makes me so happy. The good you send out will return to you, allowing even more goodness to be planted. Bravo! and happily Upvoted! Awesome. Thanks for your nice comment. I dig your comment, so I upped and followed! Thank you very much for your comment. We wish to keep helping the kids and hope it will go so long with help of Steemit Community. I really think this is great and I hope you will get support from Steemit community... With so many scammers these days blockchain is allowing us to make everything transparent and this should be the future of helping the ones in need - Especially children. It is great platform to do something bigger that was out of our imagination. Hope one day we will able to build a permanent school for the kids. Our monthly report shows how we are using your upvotes and revenue we received on steemit. Any suggestions and advice will help our initiative better. i admire what you do! !keep up the good work!! congratulations!! This story warms my heart!! Great initiative! You got my upvote :) Good luck! Thanks queen for your kindness. A very nice initiative, if its possible for you to convey this message to the person whosoever is utilizing the funds - that never distribute packaged food to children,as i could see in some of the images, use as much as seasonal fruits and local vegetables and cook them in utensils not made up of aluminium. So that the money we are sending find its best use. Thanks a lot for your message and advice. If you look to the blog @SchoolForSDG4. You will find weekly fruits and snacks program we organize at school. We try to organize fruits most time instead packaged foods. Sometimes we get guest visit and receive packaged foods but it is not often. As I organize fruits program for their health and development, I will care your advice.. Thanks for your donation my friend. Congratulations @adsactly, this post is the second most rewarded post (based on pending payouts) in the last 12 hours written by a Superhero or Legend account holder (accounts hold greater than 100 Mega Vests). The total number of posts by Superhero and Legend account holders during this period was 27 and the total pending payments to posts in these categories was $646.48. To see the full list of highest paid posts across all accounts categories, click here. Generosity, this is the best thing about steemit. Keep up th good work guys I know there are tons of good people still available out there. Of course we will. Thanks for encouragement and support by comment and becoming part of the initiative with upvotes. This is so amazing! Here you can see how helpful,powerful and strong can blockchain and cryptocurencies be! And everyone who saids that cryptocurencies are fraud has to be just really blind or stupid. Steemit can be a giving community. Thanks @chieppal for your kind words. Great work!!! I hope this post makes a bundle for those kids!! New Followers get 0.001 SBD$ and an upvote for free!! Great work by all concerned. Thanks @adsactly. That is one best thing and beauty of steemit and steem agains poverty and education .all around world need clean water,food,health and free education that is the right every Human. that effort of steemit and the Blockchain that is great thank you it up for great cause with difference any we can do that knock the door will be with you thank you. Congratulations! 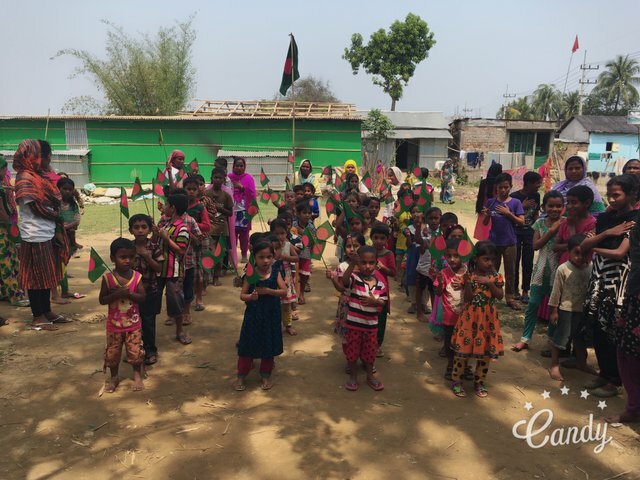 This post has been upvoted from the communal account, @minnowsupport, by azizbd from the Minnow Support Project. It's a witness project run by aggroed, ausbitbank, teamsteem, theprophet0, someguy123, neoxian, followbtcnews/crimsonclad, and netuoso. The goal is to help Steemit grow by supporting Minnows and creating a social network. Please find us in the Peace, Abundance, and Liberty Network (PALnet) Discord Channel. It's a completely public and open space to all members of the Steemit community who voluntarily choose to be there. this post is about my country. Hi @adsactly, sorry to reply off-topic here but I am a follower and know you are one of the people who want to see STEEM succeed so i am hoping to reach out to you for support. I would like to invite you to have a look at my most recent post where I propose to combine the powers of Steemit with Bitshares, to create an even more powerful community. I am only a small minnow on here with almost no outreach, so I would really appreciate your support or perhaps you can point the idea out to some people who are more in the upper ranks! Thanks in advance! Is this a legitimate effort or are you bluffing?? This is a great project! I love what you and the group are doing. I am working on a site and it will attract more people to donate using the STEEM blockchain! I read a post about SMTs and also concept of tokens for donors and how you explained on post. I Think it will be a great support for charity to received from big community. thanks for resteem and comment. Very nice work. I wish you continued success. Thanks a lot @archura . I will keep it up. This COMMENT has been DOWNVOTED by @miti for its content. I'm not a BOT and my aim is to clear posts by trolls and spammers. Want to support me? Upvote this comment, delegate SP to me or make a donation. I need more Steem Power to clean as many posts as possible. Thanks! If you do want to report a spammer or troll, reply to his comment with "@miti downvote"